Home » News » Business News » The future of libraries – could it really be bookless? As reader’s transition to digital tablets and public spaces become more high-tech, leading interior specialist Innova Design Solutions has declared that we could start seeing “bookless libraries” within a generation. The prediction comes as figures show sales of printed books fell by £150 million in the five years from 2009. 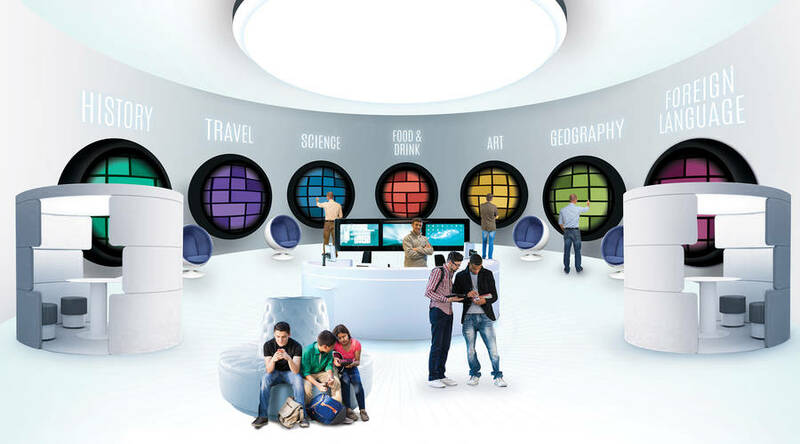 As part of a campaign to understand how libraries can remain popular, viable and representative of the nation’s reading habits, Innova has released an artist’s impression of how these high-tech future libraries could look. Melanie Laing, director, Innova Design Solutions said: “We have seen a spate of library closures throughout the UK due to local authority cuts. These budget limitations mean libraries have been unable to move with the times and adapt to the needs of the public in the digital era. However it’s clear that libraries need to change to survive. “Here at Innova, we think libraries are an essential part of the fabric of communities. A place for people of all ages to come together over a shared passion. With long-term trends indicating that books are going digital however, there are huge implications for traditional libraries. This begs the question – how will they look in the years to come? “So we began to ask ourselves what people will want from libraries in the future, how they will look and what they will feature – and all the evidence is pointing towards libraries becoming high-tech knowledge centres, community hubs and even interactive cafés that are a far cry from the libraries of today. Or as we’re calling them – bookless libraries. “The bookless library as we see it wouldn’t need to be as big, because it wouldn’t need to hold as many books. As such we’d like to get reading enthusiasts thinking about what libraries could do with the extra space created. For more information about Innova, please visit www.innova-solutions.co.uk or call 0161 477 5300.